Next week I’m traveling to Canada to visit my son. Excited? Yes. Have I started packing? No. I know last minute I’m going to be running around like a headless chicken. I need to put away the spices, grains, flours, lentils everything in the fridge. I hate this part. The weather here is so humid that food gets spoilt within a month in not stored in the fridge. I need to still make a few goodies to take for him. I need to pack. I was joking with hubby dear that he might as well convert one of the bedrooms into a cold storage. Oh well, let me just relax for a bit and blog! My son in law loves kheer. He’s never too full when it comes to kheer. Once I asked him what type of kheer was his favorite and he said any. Whenever he comes down to Bangalore when we’re there, kheer is on the menu. I usually make a bit more so he can enjoy it the next day too. When I was making this kheer with red rice I was wondering whether he would like this kheer. Well, the only way to find out is to make it for him when I see him next. My third choice for kheer was an avocado kheer. (Check out the other two kheers I’ve made, carrot and coconut kheer and makhana and dry fruit kheer). However, I’m not sure how the avocado color and taste would turn out after cooking it with milk. Maybe will experiment some other day. I usually plan pretty well for the BM themes, but this time, today’s kheer was like made today! So there was option of taking a risk. Ever since I made red rice porridge for the BM breakfast theme, I’d wanted to make kheer or pudding with it. So avocado was pushed aside and in came red rice. Red rice usually takes a long time to cook, so I pressured cooked it. Though it does not become soft or mushy like the white rice, it’s soft enough to enjoy a bite with each spoonful and not forgetting the pleasant earthy taste you get from the rice and jaggery along with the flavors of the spices added. Wash the red rice and soak it in the measured water for 20-30 minutes. Add the rice along with the water and 1 cup milk into a pressure cooker. Let the pressure reduce and then open the lid. Heat ghee in a saucepan over low heat. Add the chopped nuts and fry them for a few minutes. Remove them using a slotted spoon and keep on the side till required. Add the cooked rice into the pan along with the liquid and remaining milk. Reduce the heat and let the mixture simmer for 5-7 minutes or till it becomes thick. Add fresh cream and jaggery powder. Mix well. Let it simmer for 3-4 minutes and stir it frequently. Add the raisins, saffron, nuts, cardamom and nutmeg powder. Mix well and serve hot or cold. 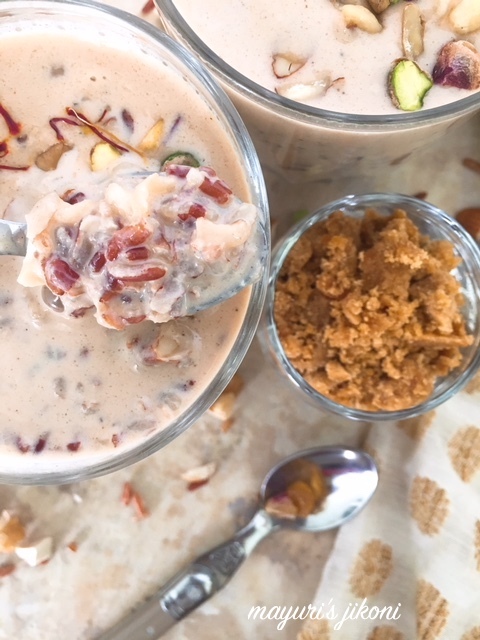 If you want to serve it cold, transfer the kheer into a glass bowl and keep it in the fridge till its time to serve it. You can cook the rice in a pan along with the milk and water, the cooking time will increase. Remember to stir if often. Add nuts and spices of your choice. Can replace the jaggery with other sweeteners. Red rice is a very interesting choice for kheer. For someone like me who is not fond of mushy kheer this would be perfect. Thanks Varada, try it you may love it. Kalyani thank you and wish I could send some over. Wow this is surely a different combination for the kheer…enjoy your trip and click loads of food pics! Red rice kheer looks absolutely delicious with fabulous texture. How creamy its looks.. I love to dish out kheer with red rice as well.. Thank you Priya, I made it for the first time and loved it. I haven’t used red rice so far and so cannot imagine the texture. But it is an interesting variety to use for kheer. Red rice has a nutty kind of taste and the texture is like white but will not get mushy. Mmmm, I love red rice! Black rice too. I’ve never heard of this dish though, but it looks outstanding! and I agree, red rice has such a wonderful nutty texture! Hoping to try this soon. Thanks Catherine, its just like rice pudding but with red rice. Wish I could pass a bowl to you. I’ve never had kheer. This makes me want to try it and this recipe is a perfect place to start. Please do try, if you like rice pudding then you’ll like this one too. Oooooh, I am never too full for kheer! Making it with red rice is a great idea! Thank you so much Jenni. Adding red rice in kheer is quite brilliant. The colour of the kheer looks so good and it surely looks fabulous.. Delicious kheer .. red rice is indeed healthy.. does it take a long time to cook..I must try too. Thanks Shobha, it does but I soaked it for a while. You could even pressure cook it. Thank you, do try it, you’ll like it and then probably think of adding ingredients that you like. I grew up eating rice pudding but it was the southern type of rice pudding. I have not tried your version out but since I am a rice pudding lover I will put yours on my to do list. The ingredients sound great. I bet it’s full of flavor! Thank you so much, its pretty easy to make and yes its very flavorful. Sounds interesting, have never tried kheer before. But I like puddings, so I’m sure I would like this. Thanks for sharing! I have to confess I have never eaten kheer but this looks and sounds delicious. I’d love to try making it. Jacqueline if you’ve made rice pudding then this is similar, its called kheer in India. Try it, as its a delicious dessert. What a delicious dessert! I have had red rice before and loved it but kheer is new to me. I bet avocado kheer is delicious too! Thanks Nicole. Kheer is the Indian name for rice pudding. I’ve yet to try an avocado kheer. I’m drooling looking at that yummy red rice kheer. I love rice kheer and your red rice version sound just amazing. I would LOVE to make this some time. Thanks Pavani, please do try it.. its delicious. Amazingly delicious! I love sweets and kheer is one of my favourites. Red rice kheer is awesome for parties. I should try making with red rice, never thought of making. It looks delicious. Thank you Ritu, red rice is often available in health shops and I’ve seen it some grocery shops in India. Thanks Freda and I will have to try making sanna with it. I have never tried red rice. So its new to me. But your pictures are showing some really interesting flavors. Would love to try this at home. Thank you Avin, try it as red rice is available in India. Lovely usage of the deep red rice, what variety do you prefer? Thank you so much, so far have tasted only the medium grain variety and liked it. Love the addition of red rice, so rustic and innovative recipe. Will surely give it a try. Thank you Meghna. Please let me how it turns out for you whenever you try it. Mayuri, I personally love the flavor of red rice and I have been looking forward to making this for a long time. Love the beautiful red color and the flavor must have been so amazing. Thank you so much Sandhya. The color is both from the rice and the jaggery. Have safe and good trip to Canada. Kheer looks delicious. My loves rice kheer with lots of nuts. Mayuri, this red rice kheer looking so tempting. Having jaggery in it makes it more tastier as well as healthy. Feeling like having this bowl now itself. Great share. Never thought of making kheer with red rice! It really looks so nice Mayuri. I also like the fact that it is not mushy! Thanks Padmajha, we loved the lovely texture of red rice. Never got a chance to taste red rice di. But I have bookmarked 2-3 recipes with it, one being this one . Thank for the lovely share. The kheer looks delectable ! Poonam thanks and do try out red rice, it has a lovely earthy nutty flavour.